This article walks through a therapist on starting a Telehealth Session with TheraNest and includes other FAQs. Telehealth sessions will be clearly marked the agenda, calendar, and clients appointment list. Only the therapist on the appointment will be able to start the session. The client's appointment list will indicate if the session is Telehealth. Click on the drop down next to the client that says "Telehealth Session" to see the option to start the session. 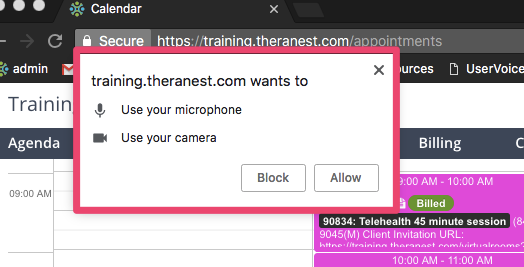 If this is your first session your browser should ask permission to use your Microphone and Camera. You must say ALLOW. 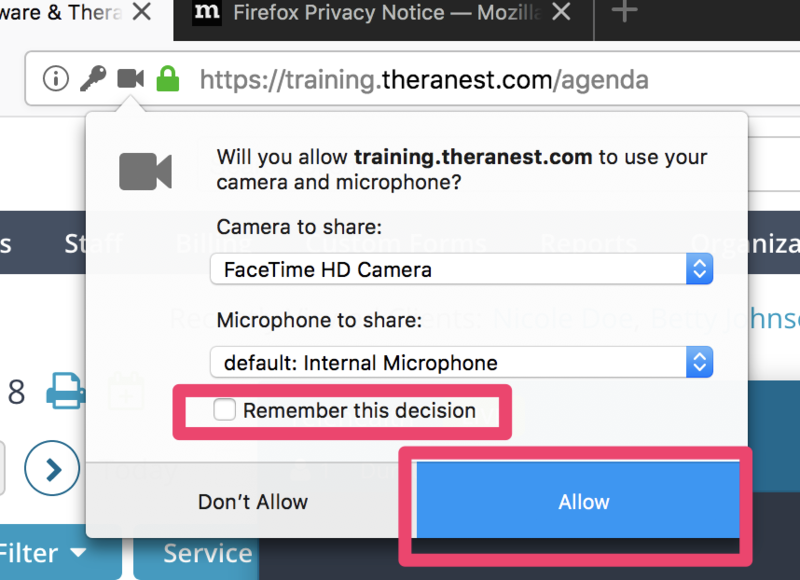 If you do not receive the prompt above then you will want to make sure your browser settings allow for you to use your camera/microphone. Click the three vertical dots in the top right corner of your browser window. When the session begins your audio and video will be defaulted to off. You will need to manually switch those on for the client to see and hear you. Each session has a limit of 3 hours. Your 3 hours will begin from the first time you click "start session." Even if you leave the call and come back your 3 hours continues to count down. You will automatically logged off from the session at the 3 hour mark. Is Telehealth in TheraNest HIPAA compliant? Yes. We take your data security seriously and encrypt all your information by HIPAA standards and are HIPAA compliant. Your data is continually and securely backed up. We use Amazon for Hardware and physical security because they are HIPAA compliant and have to follow many rules and that helps us with compliance. TheraNest does not record or store the audio or video from Telehealth sessions. What equipment do I need to offer Telehealth sessions? A computer, tablet, or phone (no applications or software to download). An external or integrated webcam. An external or integrated microphone. An internet connection with a bandwidth of at least 10 MBPS. We recommend an Ethernet cable over Wifi when possible to ensure you receive the best possible connection through your internet provider. You can check your internet speed here. You should shut down all background applications to ensure Telehealth receives the majority of your internet’s bandwidth, especially applications that use your camera. Do you recommend specific internet browsers?